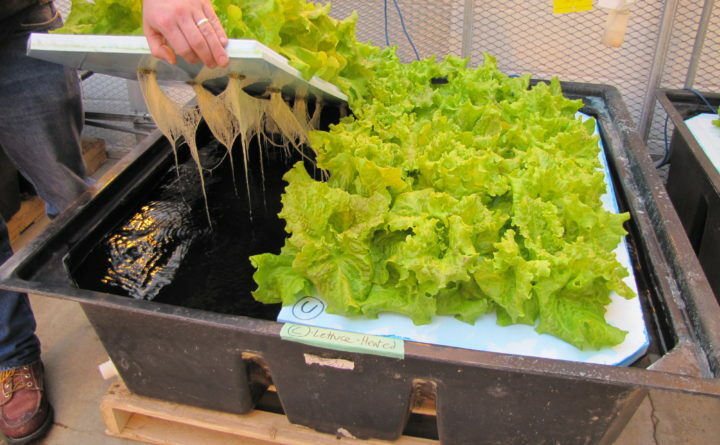 Lettuce growing in deep flow hydroponics; a student is lifting up part of a Styrofoam board to reveal the roots and the water underneath. Growing plants without soil: No, it’s not science fiction — it’s hydroponics. At its most fundamental level, hydroponics is a method of growing plants in a water and nutrient solution without soil. Instead of the earth providing the plants sustenance, the macro and micronutrients necessary for plants are added by hand through mixtures that can be purchased online or at one of the many hydroponic retailers. The method allows the roots to have direct contact with the nutrients and oxygen for a more efficient — and often speedier — growing experience. 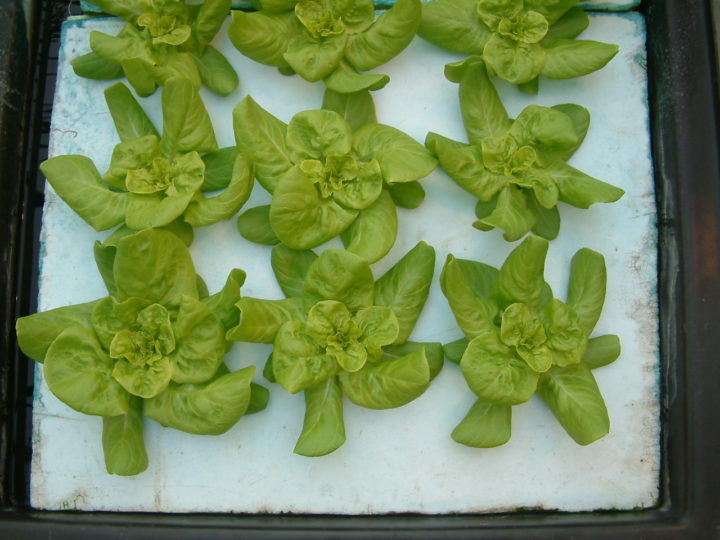 “Boston”-type lettuce growing in deep flow hydroponics using blue Styrofoam. Different types of hydroponic systems experiment with the various ways plants can absorb water through their roots. Hydroponic systems come in all shapes and sizes, from desktop aeroponic herb gardens to enormous commercial hydroponic enterprises. The substrates that keep the roots in place vary widely as well, from sand and pebbles to coconut shells and rockwool. Basic hydroponic systems do not have to be complex. You can set one up in your home with a little creativity (or a little bit of money to purchase a premade system). Hydroponics are especially great for urban homesteaders who lack large yards, or plant aficionados looking to green up their winter blues with some creative indoor gardening. What can be grown using hydroponics? 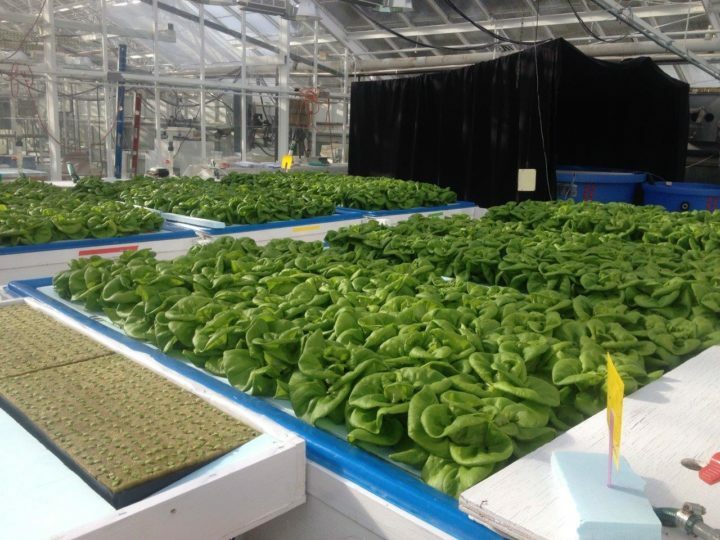 Hydroponic lettuce ready for harvest. Most experts recommend starting out with Bibb lettuce or some other leafy green. Lettuce requires less light than fruiting crops and take a little more than a month to grow. Herbs are similarly low-maintenance starter plants for hydroponic systems. Fruiting plants such as tomatoes that require more resources and physical support are more challenging. What are the advantages and disadvantages of hydroponics? When done correctly, hydroponic gardening also grows plants faster and is more resource efficient. “Raising plants hydroponically will use about 90 percent less water than raising them in a soil based medium,” Timmons says. Having a view of the roots also makes for easier troubleshooting. “One of the good things for hydroponics is that you get a chance to see what the roots look like,” Wees says. White roots, he says, are healthy, but if you notice black or brown growth on the roots, it could be some sort of bacteria indicating that you need to change the water or replace the system entirely. The advantage of control, however, can also be a disadvantage. Hydroponic systems require more maintenance and are often less forgiving. “If you leave things to chance, you can overdose your plant with nutrients or starve it,” Wees says. 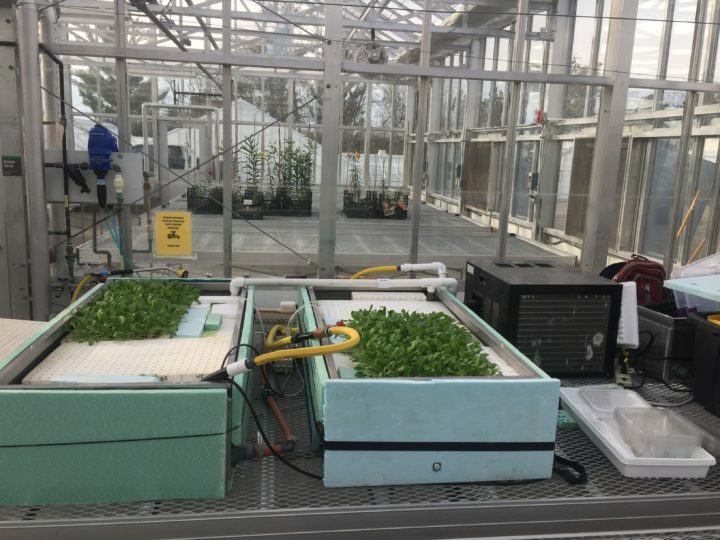 Hydroponic systems can also be more expensive to set up than a garden in your yard — not only in terms of the infrastructure, but also the cost of the water and electricity required to maintain the system. 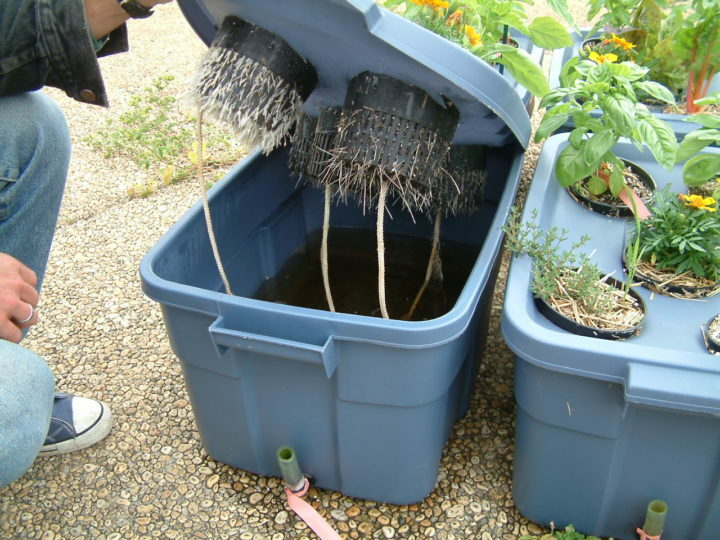 Hydroponic system with a “stagnant” water reservoir in the bottom of a plastic container (e.g. “RubberMaid”) that is wicked up to the roots of plants that are wedged into the lid of said container. How do you set up a hydroponic system? You can experiment with some of the more complex methods as you grow more comfortable with the basics, but the easiest hydroponic method for beginners is Deep Water Culture, or DWC. In this system, the plants’ roots are suspended in the water-nutrient solution and oxygenated through an external source. 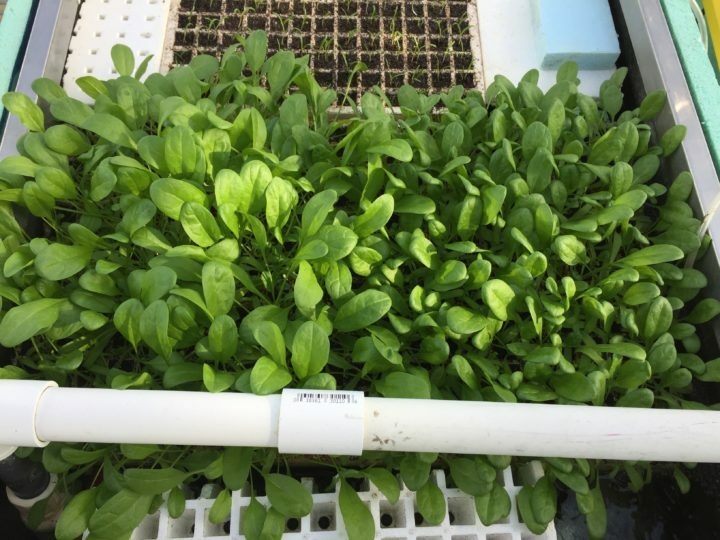 A starter hydroponic kit that uses this method can get you started, or simply use a 20-gallon aquarium tank or plastic bin, an aquarium pump, some seedlings and styrofoam with holes for the seedlings to grow in. The spacing for the holes in the styrofoam will depend on the plant. Lettuce will need about 8 inches between plantings to give the heads adequate space to grow. You will also need a hydroponic nutrient mixture, which serves as a sort of fertilizer for your water-borne plants. 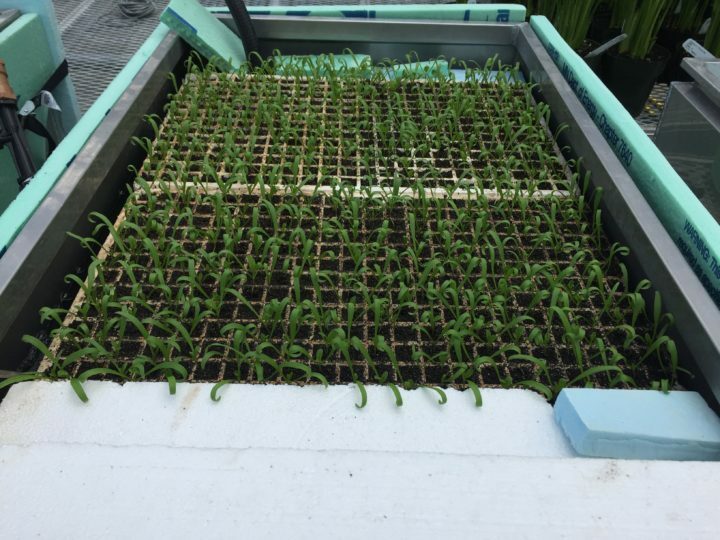 Plants growing using the Deep Water Culture hydroponic method. The requisite ratio of water to nutrients will be included in the nutrients’ instructions. More water and nutrient mixture should be added every few weeks as the plants lap up the solution. Tap water will work fine for the most part, though it depends on your location. Zheng says that in Ontario, where he is based, the water is hard. The sodium chloride used to soften the water can harm some plants. Because of the confluence of water, nutrients and light, hydroponic systems can be hotbeds for algae. For the most part, algae will not hurt your plants, but it can be disquieting. “It’s more aesthetic than anything else,” Wees says. “The best way to prevent algae from growing is to make sure the water is always in the dark.” You can grow the plants in an opaque bottomed bin or cover the tank with black construction paper up to the water line. The logistics of hydroponics can seem intimidating for less handy homesteaders, but the experts all agree that the best way to get started with hydroponics is just to try it for yourself. “The best thing to do is just do it,” Timmons says. “And have fun,” Zheng adds.